New polling and the long expected confirmation by Ruth Davidson that she would consider the move to Westminster speaks to interesting dynamics in Scottish and UK rightwing politics, writes David Jamieson. On 10 December Survation polling found that the vaunted Scottish Tory surge had halted at both Westminster and Holyrood, seeing the party slide back to third place behind a somewhat rejuvenated Labour in the Scottish Parliament. The party had moved into second place with 31 seats in the 2016 Scottish election and sent a tranche of 13 MPs to London after 8 June. Two days after the poll Ruth Davidson – who’s leadership (and indeed name, since it supplanted the Toxic Conservative brand in recent Scottish elections) has been made synonymous with the party’s revived fortunes – made the long expected declaration she would consider moving to the Westminster Parliament in the pages of the Spectator. The long held suspicions about Davidson’s career move have to do with a well understood item of Conservative society. In party mythology, the commanding height of the British state and the ‘mother of parliaments’ is the only dignified place for top tier Tories. But the stalling prospects of the Ruth Davidson Project should enlighten both rUK party admirers and her substantial retinue of Scottish and UK media cheerleaders. What is the Ruth Davidson Project? As discussed by myself and James Foley elsewhere, it is part of a strategy to recompose the Scottish Conservative bloc. All political parties and (through most of their life cycle) social movements are coalitions of differing outlooks converging on certain goals. The challenge of the Scottish Conservatives in the wake of the Scottish independence referendum was to form a bloc of reactionary opinion wide and deep enough in Scottish society to head-off the threat of secession and the wider social aims of the independence movement. To achieve this, Davidson would need to draw together two large sub-blocs. The first is the larger part of the Scottish middle class. Senior management and professional figures combined with small business owners largely oppose Scottish independence, mainly for the reasons that such layers typically oppose social disturbance. When you have an above average income, assets and a relatively elevated social position, why endanger these things by encouraging social change? When your life is a satisfying enough endeavour, and you can effect your own material position in society simply by engaging your actual or cultural capital – who needs a collectivist movement to even effect change? This miserable social element also includes large numbers of “opinion formers” in the media and cultural spheres, and they flex their muscle in the service of that great cause: keeping things ticking-over pretty much as before. But this social element is relatively insubstantial. It certainly isn’t a match for the coalition mobilised for independence in 2014. Another partner is required for the Ruth Davidson Project to be viable. This second sub-bloc is the reactionary right proper. This section presents a more aggressive and various programme of resentment against social groups seeking change. It is also based in parts of the middle class, but it has inroads into portions of the working class as well. The classical structure for this social element in Scotland is the Orange Lodge. The order has experienced something of a revival in recent years, boasting of its ability to win councillors and buoyed by the entrance of the Northern Irish Democratic Unionist Party into the UK government. Its internal class sociology is the blueprint of reactionary mobilisation. Its middle class leadership is in a position to offer working class Protestants a sense of identity and superficial empowerment that can offset or confuse the experience of real material decline in its communities. The Scottish Tories have reconnected not only with Orangeism, but with a wider mood of reactionary populism in Scottish society which has felt locked-out throughout much of the Holyrood period and still suffers a relatively low level of organisation in Scotland (in comparison to large mobilisations like the EDL and UKIP in England). The importance of this second block to the Ruth Davidson Project is why the party leadership has proved so reluctant to expel councillors and MSPs for sectarian, misogynistic and racist (especially anti-traveller) stances. She needs a way to connect the party to an angry and bigoted quadrant of the Scottish population. But this is also why Davidson’s media interlocutors are so unwilling to discuss the upsetting reality of this toying with reaction. Most of the commentators who tout her brilliance are from the well-healed, liberal conservative wing of her support. They don’t want to acknowledge the unseemly, bigoted and irrational wing, dependent on it though they all are for the Davidson Project’s success. And so from the papers we get Ruth the moderniser, Ruth the pro-EU (or at least soft Brexit) restraining hand on the UK government. Ruth the new face of a modern, open, dynamic, Conservatism. The Survation polling tells us many things we have suspected about Scottish politics – including that a pro-independence majority is becoming increasingly difficult to sustain in the Scottish Parliament after 2021. And this may well sharpen arguments about the timing and strategy of any future independence referendum. But the overall picture remains a remarkable one by European standards – with the centre left to left of centre once again totally dominating the chamber by Survation projections, including with resurgent Labour and Green votes. Though the Ruth Davidson Project made some small dents into this picture in recent elections, its tide is now apparently in ebb, and the focus of the minor cult of personality herself has announced her near-readiness to throw in the towel. So what prospect for the Ruth Davidson Project rUK? First, it’s worth bearing in mind that Theresa May (once also treated to her own adoring column inches) attempted her own version of bloc building at a UK level to disastrous effect. May sought to draw the body of reactionary opinion built up around UKIP deeper into the Conservative party. To an extent she succeeded. But the overall effect was to sharpen factional tensions within her own party, making her position even more precarious following the 8 June election and in the face of tense Brexit negotiations. She has now lost the capacity to pursue much of a domestic agenda. Davidson’s project was more adept at adopting the cosmetics of the more liberal Tory wing, but she too has been damaged by the Tory fallout since the election. To be sure, Davidson’s inability to promote much of a policy agenda beyond opposition to a Scottish independence referendum meant she was extremely vulnerable to the deflation of the Tories UK wide. 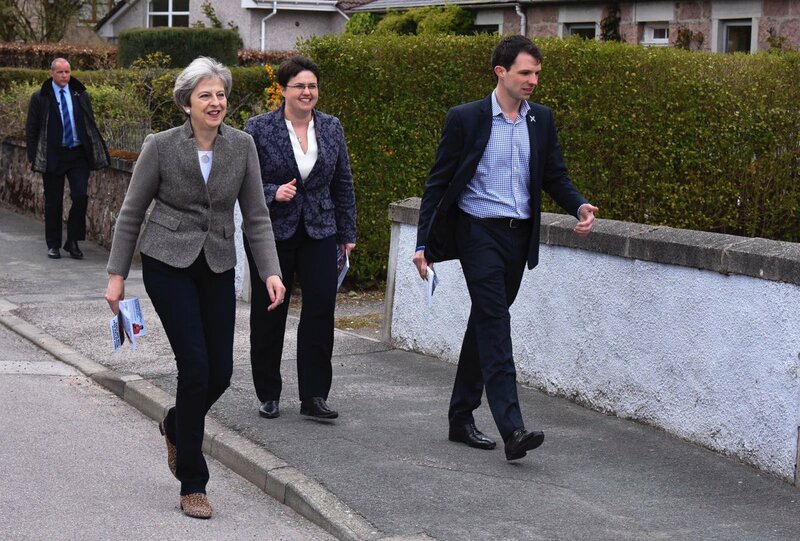 The continued illusions in the Ruth Davidson Project, especially south of the border, therefore relate more closely to Tory desperation than any real success for the Project, or any real truth to the cult. During the budget today, the colonel was surfing on her phone and looking completely disinterested. The only time she moved was to bark like a demented rabid dog when the tory group reacted badly to Derek MacKay announcing good news for Scotland public services and tax payers. Complete ignorance and arrogance on her behalf! But, a trait we have all become accustomed to. Perhaps in her head she has already assumed residence in Downing Street? It is not just the Tories who court the Orange Lodge but Labour too. During the 2014 referendum campaign the Labour Party supplied members of the Orange Lodge with Remain posters. Maybe their shared commitment to Unionism shining through or more likely, a reflection of the right focused leaning of Labour,& it showed, at least to me, how Labour and the Tories were the same. That’s right. Jim Murphy was courting them. As Stuart Campbell revealed Bizarre, because he was a Catholic. But they hate the SNP. If Labourmoves more to the left because of Corbyn, and now Leonard, that might be difficult to sustain. Friday morning 9.00am and just checked the news. Headlined in the Independent is the story that Theresa May has agreed with EU leaders that there will be no trade talks until March 2018 because the UK does not know what it wants. Headlined on the BBC is the upbeat story that Theresa May has agreed with the EU on moving on. That’ll be another success story for our punch drunk Prime Minister. Good old trusted and respected BBC to keep us right. What would we do without it. It is not my experience that the small business sector is pro union. Quite the opposite. The vast majority of businesses I deal with fall into one of two camps. A traditional “orange” pro union section and a pro indy section. The latter finance a lot of the activity of Yes and SNP branches. I always thought it was a “knowledge” within them that all you need to succeed as an independent country is determination and hard work. The orange section is beyond the pail ( irony! ), but is predominately peopled by older skilled workers who like a lot of the rest of traditional Scottish society, have not evolved to cope with the new liberal, multicultural society we now live in.